Can you believe that we are down to the final two days of our blog hop? I hope you are enjoying our projects as much as we are enjoying sharing them. If you are visiting all the blogs in order, then you should have just left the blog of the incredible Heather Summers. Be sure to visit everyone on the blog hop. There's a list at the end just in case you get lost. Dont' miss our big finale tomorrow. I have saved my VERY favorite project for the last day and here's my favorite scrapbook page! I don't scrapbook much and when I do, I tend to make digital pages in MDS. But for the Artisan Award competiton I thought that I should show the judges that I know how to stamp and scrap the traditional way, too. 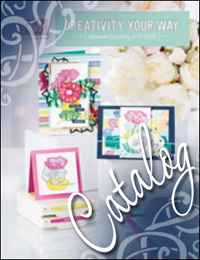 This page has it all...stamping, heat embossing, dry embossing, die cutting, digital elements, Stampin' Around wheel, embellishments, sponging...you name it, I probably did it on this page. To make it even better, I absolutely love this picture of my great niece. She is incredibly photogenic and she knows how to work the carmera with those big brown eyes! This page evolved over several weeks. I wouldn't even know where to begin because there is so much to tell. There is one thing that I really want to point out because I know you can't tell it from this picture. See that big red polka-dot bow on her head. I printed her picture twice, cut out the bow and popped it up with some dimensionals so that it looks like it is coming out of the photo. If you click on the picture and enlarge it, it is easier to see what I am talking about. To me, that was the perfect finish to my favorite page! Just one other thing...I wanted to use red polka-dotted ribbon for this page, but at the time SU didn't have any in the catalog...so I made my own. I sprayed a piece of satin ribbon with starch. After it dried, I ironed the ribbon and then used a wheel stamp and white craft ink to make my own custom ribbon. I keep tellin' ya, it's those little details that make all the difference in the world with the finished product! That's all for today. Don't forget, tomorrow is the final day of our blog hop, so be sure to check back. Now it's time to see what Sandra Farrell has to share with you today. As always, here's a little guide to help you along the way. Cardstock: Crumb Cake, Old Olive, Pumpkin Pie, Real Red, Pacific Point, Basic Black; Patterns DSP Stack-Brights-Old Olive, Pacific Point Daffodil Delight, Tempting Turquois Pumpkin Pie; Stamp Set: Easter Beauty; VersaMark Pad; White Embossing Powder; Heat Tool; Big Shot Machine; Scallop Square Die; Timeless Type Medium Sizzlet Dies; Embossing Folders: Elegant Lines, Square Lattice, Finial Press, & Perfect Polka Dots; Spiral Border Punch; My Digital Studio: Thoughtful Overlays-Lines 5; Font: CK Ali’s Hand; 5/8"; Satin Ribbon-Real Red; Jumbo Stampin’ Around Handle; Pleasing Polka Dots Builder Wheel; Uninked Jumbo Cartridge; Builder Wheel Spindle & Spacers; Whisper White Craft Ink Pad & Refill; Clip Assortment; Dimensionals. Distressing Essentials Kit-Tea Stain Pad; Mini Glue Dots, Sticky Strip, Multi-Purpose Liquid Glue. Tags: 2011 Artisan Award Winning Project, Stampin' Up!